As we evolve this web site, look for more information about the Games! See also How To Videos to learn more about the sports. 1. 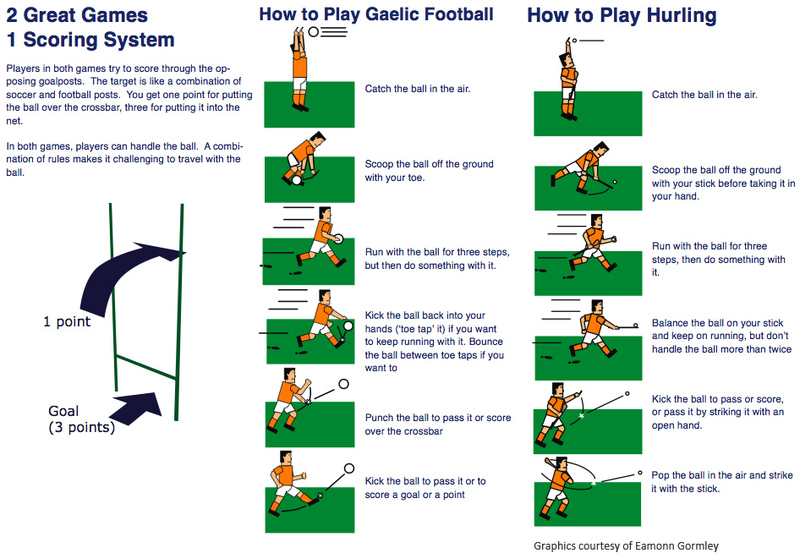 What is Gaelic Football? This is exciting news. Cal Berkeley and Stanford are two of a half dozen colleges that embrace the sport and offer future opportunity to youth in the U.S.
Gaelic Football can be described as a mixture of soccer and rugby, although it predates both of those games. It is a field game which has developed as a distinct game similar to the progression of Australian Rules. Indeed it is thought that Australian Rules evolved from Gaelic Football through the many thousands who were either deported or emigrated to Australia from the middle of the nineteenth century. Gaelic Football is played on a pitch approximately 137m long and 82m wide. The goalposts are the same shape as on a rugby pitch, with the crossbar lower than a rugby one and slightly higher than a soccer one. The ball used in Gaelic Football is round, slightly smaller than a soccer ball. It can be carried in the hand for a distance of four steps and can be kicked or "hand-passed", a striking motion with the hand or fist. After every four steps the ball must be either bounced or "solo-ed", an action of dropping the ball onto the foot and kicking it back into the hand. You may not bounce the ball twice in a row. To score, you put the ball over the crossbar by foot or hand / fist for one point or under the crossbar and into the net by foot or hand / fist in certain circumstances for a goal, the latter being the equivalent of three points. Players wear a jersey with their team colors and number on the back. Both teams must have different color jerseys. The goalkeepers' jerseys must not be similar to the jersey of any other player. Referees normally tog out in black jerseys, socks and togs. Goalkeepers may not be physically challenged whilst inside their own small parallelogram, but players may harass them into playing a bad pass, or block an attempted pass. Teams are allowed a maximum of five substitutes in a game. 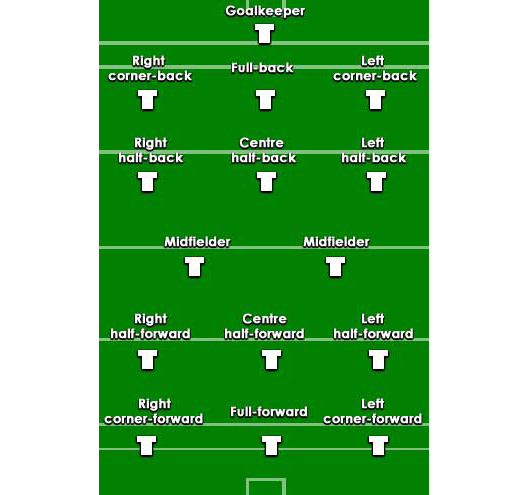 Players may switch positions on the field of play as much as they wish but this is usually on the instructions of team officials. Officials for a game comprise of a referee, two linesmen (to indicate when the ball leaves the field of play at the side and to mark '45'' free kicks and 4 umpires (to signal scores, assist the referee in controlling the games, and to assist linesmen in positioning '45' frees). A goal is signalled by raising a green flag, placed to the left of the goal. A point is signalled by raising a white flag, placed to the right of goal. A '45'/'65' is signalled by the umpire raising his/her outside arm. A 'square ball', when a player scores having arrived in the 'square' prior to receiving the ball, is signalled by pointing at the small parallelogram. The stick, or "hurley" (called camán in Irish) is curved outwards at the end, to provide the striking surface. The ball or "sliothar" is similar in size to a hockey ball but has raised ridges. Hurling is played on a pitch approximately 137m long and 82m wide. The goalposts are the same shape as on a rugby pitch, with the crossbar lower than a rugby one and slightly higher than a soccer one. Each team consists of fifteen players, lining out as follows: 1 goalkeeper, three full-backs, three half-backs, two midfielders, three half-forwards and three full-forwards. A game is played over two halves of 30 minutes (at club level) or 35 minutes (at inter-county level). Players wear a jersey with their team colors and number on the back. Both teams must have different color jerseys. The goalkeepers' jerseys must not be similar to the jersey of any other player. Referees normally tog out in black jerseys, socks and togs. Teams are allowed a maximum of three substitutes in a game. Players may switch positions on the field of play as much as they wish but this is usually on the instructions of team officials. Officials for a game comprise of a referee, two linesmen (to indicate when the ball leaves the field of play at the side and to mark '65'' free kicks and 4 umpires (to signal scores, assist the referee in controlling the games, and to assist linesmen in positioning ''65' frees).